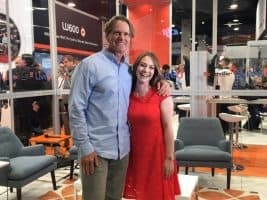 Last month, the SOC was in Las Vegas for the annual NAB Show—the world’s largest gathering of professionals in the entertainment industry. 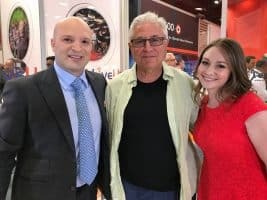 Throughout the show, the SOC worked to educate NAB’s attendees about the SOC’s mission and programs, expand Camera Operator’s subscriber base, as well as build new and strengthen existing relationships within the industry. The first day of the show was a busy one for the SOC! Featuring live streamed interviews with SOC leaders George Billinger, SOC and Mitch Dubin, SOC, the day was also filled with meet-and-greets with key SOC Corporate Members who provided private tours and demos of the latest tools on display, as well as discussions of new ways to bring value and meaning to their partnership with the SOC. 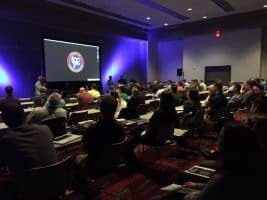 Later in the day, the SOC headed to the upper level of Las Vegas Convention Center’s South Hall to present the panel: “How I Got the Shot”. 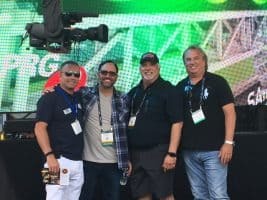 The highly popular panel was open to all NAB badge holders and moderated by Derek Stettler, an SOC Associate Member and contributing writer to Camera Operator and American Cinematographer. With a packed room, the panelists—George Billinger, SOC; Mitch Dubin, SOC; Eric Fletcher, SOC; and David Sammons, SOC—screened selected clips of their work on some of the biggest films and television series and discussed how they pulled the shots off, their onset challenges, and behind-the-scenes stories. Then the hour-long panel was opened up to a Q&A with the audience and all the panelists stayed afterward to chat (and take some selfies) with numerous audience members. 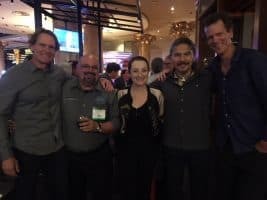 Later that night, SOC members had a chance to unwind and connect with each other at the SOC Mixer at Gordon Ramsey’s Pub and Grill in Caesar’s Palace. Sponsored by Chapman/Leonard and Panasonic, the mixer’s open bar, appetizers and good company was possibly the highlight of the day. 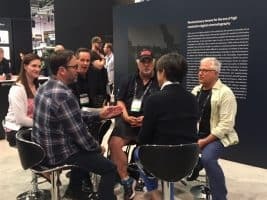 On the second day, SOC members attending NAB had the chance to get an inside look at some of the latest products from several SOC corporate members and recipients of the Technical Achievement Awards during the ever-popular Tech Tour, led by Technical Standards Chair, Eric Fletcher, SOC. 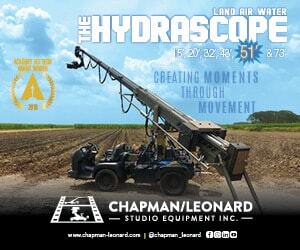 With over 40 people registered for the tour, it was a great opportunity for SOC members to learn about the newest gear affecting operators and get hands-on time surveying the various booths. Everyone in the tour also came away with swag and goodies from the various companies visited. Overall, it was quite a successful third year for the SOC at NAB and we look forward to our next!